Recently, I have gotten several emails asking me if I am planning on doing more PopSugar reviews in the future. The truth is the May 2016 PopSugar box was my last box before this one. As much as I love PopSugar, I didn’t want to mess with it while we were moving and I was waiting for surgery. I ended up getting a new subscription on Black Friday. They were selling PopSugar for $20 a box, and I couldn’t say no to that! The December boxes have always been one of my favorites of the year (here is 2015 and 2014 for reference), so I was a little bummed this one wasn’t as festive as previous years. Still, it had some great items, so I’m excited to share it with y’all! Note: This post contains referral links. If you decide to purchase a PopSugar box, I would love it if you used my link. I really love this set. It’s made out of porcelain and has a beautiful minimalist look. This is a PopSugar exclusive item, which is always fun, but I don’t love it. It’s just not my style. I love cranberry lipstick for the holidays, and it’s even better that it’s matte! This is a gorgeous color with a beautiful pigment and is surprisingly moisturizing for a matte lipstick. Apparently, this serum adds shine to your hair. I haven’t tried it yet, but it’s not a bad product to get. I can’t remember the last time I’ve used bobby pins, but these are so cute and sparkly! I was just thinking I needed to pick up ingredients for cookies, so this is perfect! Chris and I always love the food in PopSugar boxes, so we’re excited about this mix. The total value of this box is $138. I didn’t love all the items, but the catchall and ring dish set makes it more than worth it for me. 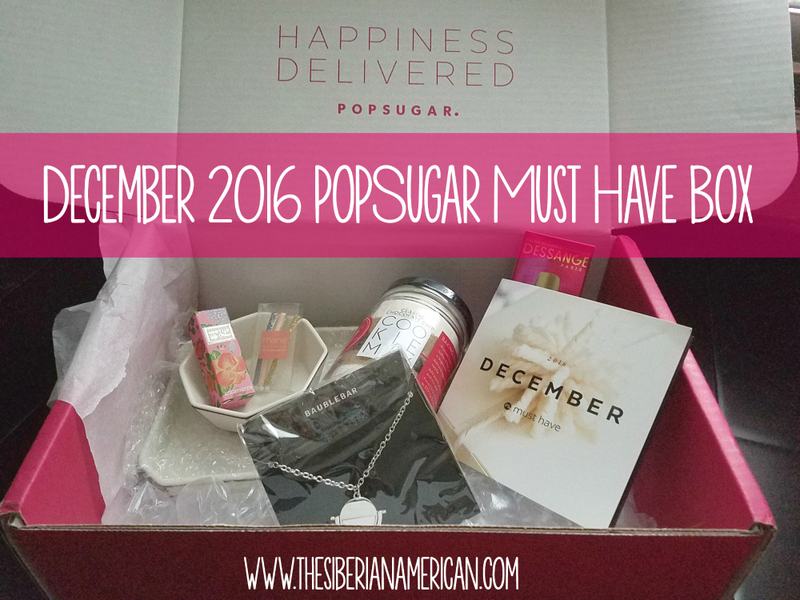 What was your favorite item in my December 2016 PopSugar box? For a minute I thought the cookie mix was a cookie candle and I got really excited! Haha! I love ring holders. I have a fox one above my sink in the kitchen and another (different) fox one on my vanity in my bathroom, haha! You did get a lot of goodies in your box! It couldn't have been more perfect timing for the cookies, and that catch all and ring dish is so cute! I have one and I don't know what I'd do without it! Sounds like the perfect lip color for the holidays!